The Russian people knew well what the attacks and pogroms of the Mongols meant. Hunger, pestilence, war, and earthquakes, all rolled into one, could not cause such damage as did the Mongols. 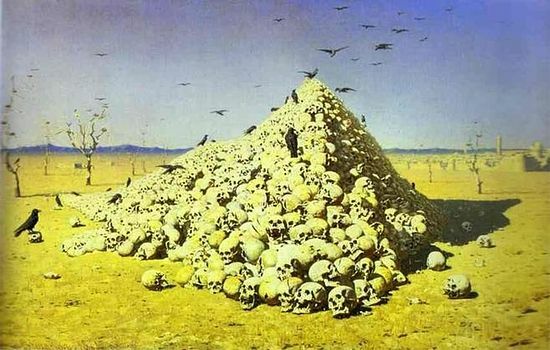 The Russian people had not forgotten the pogrom of Batyiev, nor the terrible desolation of the depopulated Russian land. Now a new thundercloud was gathering. At first faintly, and then with increasing volume, word began to spread that somewhere over there, in distant Asia, “A certain tsar from the Samarkand lands, from the Blue Horde, which was beyond the iron gates, has risen up,” and whose strength and inhuman fury surpasses all those famous destroyers who had gone before him. The Russian people knew very little about him, but they did well know that this tsar “was a most fierce bandit, worse that those before him.” How great was their horror when they heard that this terrible tsar, “the likes of whom was never heard afar under the eastern sun, is now at our door…”! Who was this new, frightful destroyer? The true name of this horrible man, who mercilessly wiped out not only the people, but all that had been created by the labor of human hands, was Timur Leng, which meant “Timur the Lame,” and the ancient Russians called him Temir Aksak, “which means, the iron lame.” This Timur Leng, or Tamerlane, had gathered an army of fierce warriors and resolved to submit the whole world to himself… His indomitable bravery riveted other warriors to him. At the sound of their leader’s customary yelp, and the swipe of his curved sword, they would throw themselves like tigers on prey at the smell of blood. In 1371, at age thirty, he had taken over all the lands from the Caspian Sea to Manchuria. The terrifying tales of his inhuman ferocity made people’s blood run cold. Like Genghis Khan, he made Asia and Europe tremble before his very name; he had flooded their lands in blood, destroyed cities, killed millions of people, and had earned, like Attila the Hun, the name, “God’s whip.” In place of flourishing cities surrounded by lush, planted fields, vineyards, and fruit trees, Tamerlane left only ruins and pyramids made of human heads, fixed in cement, as a lesson to their descendants. The citizens of one city sent all their children to Tamerlane as a plea for mercy. When the latter beheld these little ones dressed in white clothing and walking to meet him with palm branches in their hands, singing sacred hymns, a destructive demon suddenly leapt up in him, and he lunged forward on his horse. “After me!” he shouted to his cavalry. The wretched parents had to watch in horror from the city walls as their children were trampled under the hooves of horses… “My name horrifies the universe,” the fierce conqueror boasted. “Not even the depths of the sea can hide my enemies from my vengeance!” And now, just such a destroyer had shown up within the borders of the Russian homeland. A frightful year had arrived For Holy Rus’. The Russian people had not yet recovered from the earlier pogroms; but what were these attacks, what was fierce Batyi in the face of Tamerlane? The recent battle of Kulikovo now seemed to be only waste of national strength. Grand Prince Vasily Dimitrievich gathered his forces and prepared for battle… But without a doubt, the Muscovite Prince’s military preparations did not frighten Tamerlane in the least. Nieither Prince Vasily nor the people had any hope for salvation by human strength. But the entire Russian land raised up fervent prayer to the heavens; all the churches of Moscow were opened from morning until late at night. The people poured tears and fasted, and all were preparing for death. The innumerable, immense army of the terrible Tamerlane, like dark clouds, covered the area around the town of Elets on the night of August 26. The horrifying “master of the world” himself rested in his magnificent tent. The princes and khans of Asia unsleepingly and unceasingly guarded the tent and sleep of their terrible leader. But he had no sleep, for he had seen a frightening vision. He saw a tall hill, on which stood wondrous elders with rods in their hands, threatening him. There was a boundless sky over the hill… A light brighter than the sun… And in that light was a wondrous Queen, in purple garments, shining brighter that the sun, with rays like lightening. In this radiant heavenly height there was a numberless host of warriors, ready to advance upon him at the first wave of the Queen’s hand. But the Queen only calmly prayed, lifting up her hands. Suddenly, gazing threateningly at him, the Queen commanded the entire numberless host to attack him. A desperate shout sounded from the royal tent. The tsar’s men came running, and found their master in such a state as they had never seen before. The fearless warrior who had witnessed so many deaths on the battlefield was now trembling and moaning in complete exhaustion. In the morning, the fierce conqueror unexpectedly commanded the entire army to decamp and retreat hastily. The joy of the Russians was indescribable when they heard of their enemy’s speedy departure to Asia. When the Grand Prince heard of Tamerlane’s retreat he hastened to return to Moscow. Here he was met by Metropolitan Cyprian. 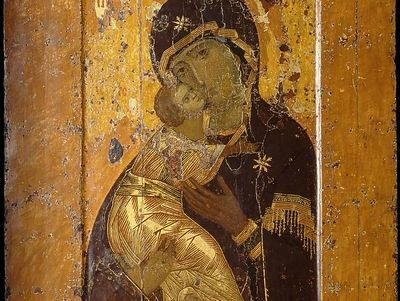 Together with the people, they raised tearful prayers of thanksgiving before the miraculous icon of the Mother of God. 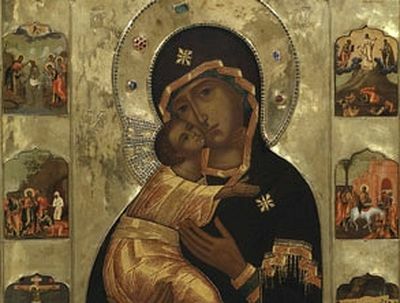 A church was built where the famous meeting took place, dedicated to the Most Pure Mother of God “Of the Honorable Meeting,” so that the people would not forget the works of God. 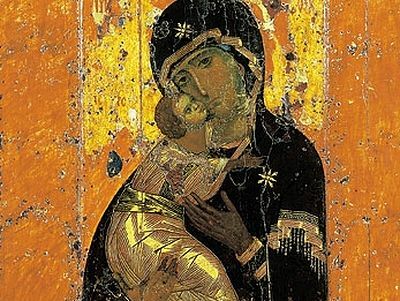 At that time the feast of the Vladimir icon of the Mother God was established, on August 26/September 8. And Tamerlane? He poured out his wrath upon the camps of the Kipchak hordes, upon the Tatar cities, Astrakhan, and Asov. He left them in ashes. And the advance of Tamerlane, which threatened all of Russia with terrible destruction, actually brought Russia great benefit: this frightful enemy of Christianity struck a fatal blow to a long-time foe—the Golden Horde. 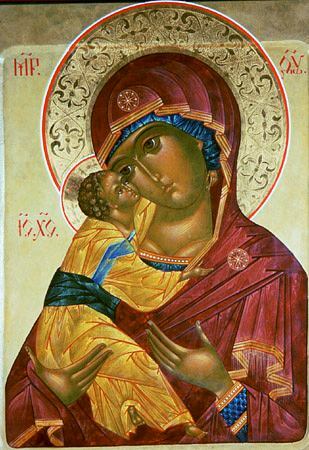 On Monday, July 5, 2010, the eve of the feast of the Vladimir Icon of the Most Holy Mother of God, Archimandrite Tikhon, Superior, and brothers of the Moscow Sretensky Stavropegial Monastery celebrated the All Night Vigil for the feast.